ForeUI V4.6 is just released. Since this version, it is possible to dynamically add or remove item for the ComboBox element in HTML5 simulation. With these two actions your HTML5 simulation can show the audience different drop-down list according to previous interactions, and make the simulation much more like the real web application. Now the Menu, Menu Bar, List and Radio Button Group are interactive elements in edit mode now. It means you can click on these elements and interact with them in edit mode, just like interacting with them in HTML5 simulation. 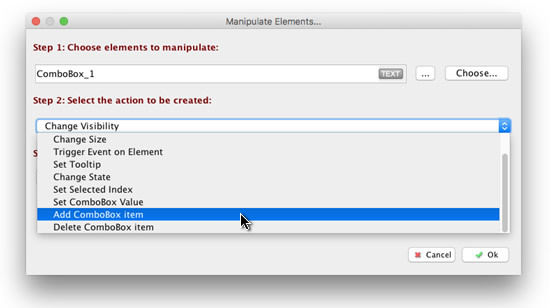 This makes it more intuitive to specify the current selection of these elements in edit mode. How to Get the New Version? You can download the latest version from the download page, or upgrade directly within ForeUI if you already have any 4.x version installed. If your ForeUI license is more than one year old, you may need to renew your license to use this version.